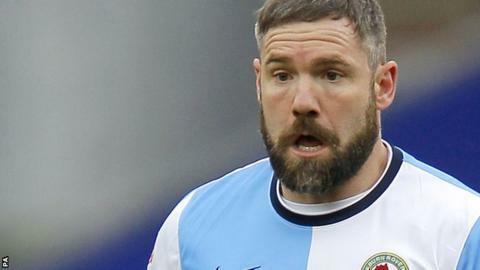 Oldham Athletic secured a hard-fought point at Doncaster in David Dunn's first game as interim Latics boss. Doncaster took the lead when defender Andy Butler headed in Cameron Stewart's free-kick, only for Jonathan Burn to head home in reply eight minutes later. James Coppinger and Dany N'Guessan went close for the hosts in the second half. Gary MacKenzie also had an effort cleared off the line for Doncaster, in a result that sees Oldham join Rovers in League One's bottom four. "I think we did very well in terms of what we've asked of them all week. "After a disappointing result last week, we needed a reaction. "I think one thing you can say is that there are things we can improve on." Match ends, Doncaster Rovers 1, Oldham Athletic 1. Second Half ends, Doncaster Rovers 1, Oldham Athletic 1. Lee Croft (Oldham Athletic) wins a free kick in the defensive half. Attempt blocked. Gary Mackenzie (Doncaster Rovers) right footed shot from the centre of the box is blocked. Corner, Doncaster Rovers. Conceded by Michael Jones. Attempt missed. Andy Butler (Doncaster Rovers) header from the centre of the box is just a bit too high. Corner, Doncaster Rovers. Conceded by James Wilson. Attempt blocked. James Coppinger (Doncaster Rovers) right footed shot from the right side of the box is blocked. Connor Brown (Oldham Athletic) is shown the yellow card for a bad foul. Attempt missed. Dany N'Guessan (Doncaster Rovers) header from the centre of the box is close, but misses the top right corner. George Green (Oldham Athletic) is shown the yellow card for a bad foul. Cedric Evina (Doncaster Rovers) wins a free kick in the defensive half. Foul by George Green (Oldham Athletic). Substitution, Oldham Athletic. George Green replaces Mark Yeates. Corner, Oldham Athletic. Conceded by Gary Mackenzie. Michael Jones (Oldham Athletic) is shown the yellow card for a bad foul. Attempt missed. Dany N'Guessan (Doncaster Rovers) left footed shot from the left side of the box is just a bit too high. Cedric Evina (Doncaster Rovers) wins a free kick on the left wing. Carl Winchester (Oldham Athletic) wins a free kick in the attacking half. Substitution, Oldham Athletic. Brian Wilson replaces Jonathan Burn. Attempt missed. James Coppinger (Doncaster Rovers) right footed shot from outside the box is close, but misses to the left. Substitution, Doncaster Rovers. Richard Wellens replaces Oscar Gobern. Substitution, Oldham Athletic. Simonas Stankevicius replaces Dominic Poleon. Cameron Stewart (Doncaster Rovers) wins a free kick on the right wing. Attempt missed. Dany N'Guessan (Doncaster Rovers) left footed shot from the right side of the box is close, but misses to the right. Corner, Doncaster Rovers. Conceded by Timothee Dieng.